By Owens Golden Hot Rod and Dam Owens Rave Image/Hide a ways Rave reviews. SOLD/4-sale 3500.00 Went to Colorado. State Fair 2012 3rd out of 8 in class. FOR 2010 HOT ROD BREED 2 CHESTNUTS MARES NOT OURS, ONE SOLID BAY(PAGAN, OUR MARE) AND A MY SPOTTED BAY AND WHITE MARE(APACHE). SHE IS DUE END OF MARCH AND SHE WILL BE THE FIRST. This filly is really nice and has allot of show prospect. Is for sale and nominated for IL fututurity. WE DONATED STUD SERVICES TO THE FOLLOWING STATES FOR HOT ROD IS ENROLLED IN THE ALL AMERICAN CUP FUTURITY AND AUCTION IS IN JAN 2010 STARTING BID IS 500.00. HE IS ALSO IN THE WISCONSIN FUTURITY AUCTION. MARCH 2009 A GOLD CHAMPAIGM OUT OF A LIVER CHESTNUT, "BUTTERCUP". 5-4-09 BLACK FILLY OUT OF BLACK MARE NOT JUST A PRETTY FACE THAT HAD THE BUCKSKIN LAST YEAR?? 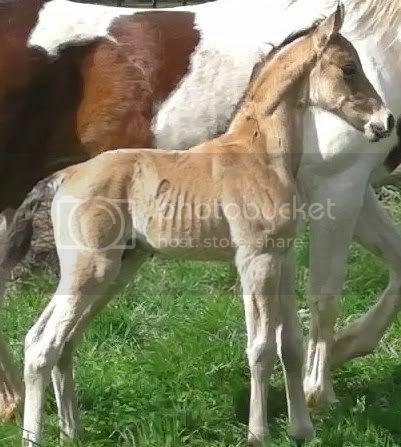 PALOMINO COLT OUT OF A LIVER CHESTNUT MARE. "MAFIA CONNECTIONS" in Kentucky. HOT ROD GOT 2 MARES IN FOAL FOR 2008 ONE IS A BAY MARE, DREAM GIRL'S SATIN( I BROKE THIS MARE IN 2005), AND OUR BLACK MARE ON OUR MARE PAGE, NOT JUST A PRETTY FACE. BOTH MARES HAD BUCKSKINS!!! AMAZING :-) THEY BOTH SHOW SOME OF HOT RODS CARACTERISTICS ON THERE HEAD, THEY BOTH GOT HIS NECK/SHOULDERS AND LONG LEGS, THE EARS SEAM TO BE THE MARES WITH MOST OF THE HEAD CARACTERISTIC. HE DEFINITIVE THREW THE COLOR. these photos are from a month later.